NYC-based Dash company recently debuted a prototype of a Greek Yogurt Maker that makes delicious, creamy yogurt free from fake sugars and preservatives. Not only does this product have style, but it saves on packaging from purchasing yogurt in plastic containers. Best of all, it can even whip up vegan yogurt goodness from non-dairy milks like coconut, soy, or almond! Once milk is added into the machine, it strains and cultures the milk over several hours. Dash was sampling their yogurt and it was out of this world, especially since no sugars or preservatives were added. 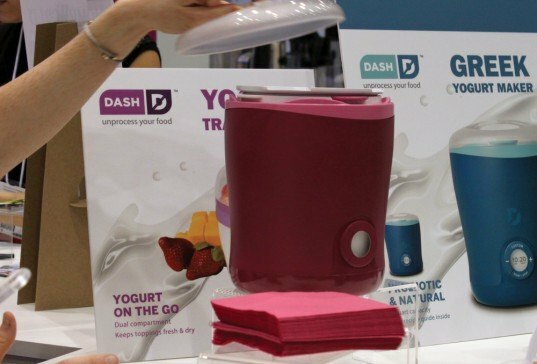 The Greek Yogurt Maker is expected to be on the market soon, retailing for around $49. 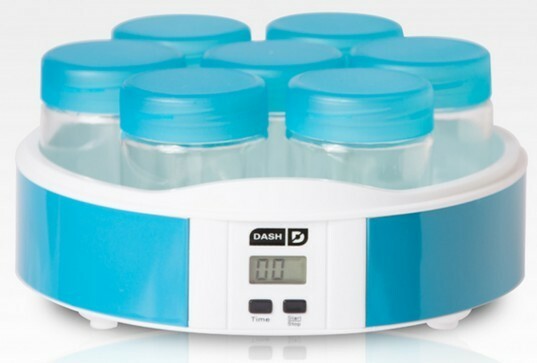 The new Greek Yogurt Maker makes improvements on Dash’s original yogurt culturing appliance. The original seven jar set required a time intensive process for heating milk on the stove, dividing into the jar, and setting the machine timer for several hours to culture. We love that the new Greek Yogurt Maker combines all of the steps into one appliance, and is also a beautiful object for your countertop! I work for StoreBound, the company that makes the Dash Greek Yogurt Maker. It is BPA free! Please feel free to contact us with your questions and suggestions. The product will begin shipping in July 2013. Hey cynyc! This Greek Yogurt Maker shown at the Housewares show was a prototype (should be available to purchase soon), so it is unclear if that model was BPA free. BUT - the other yogurt makers that DASH offers are all glass and BPA free plastic, so I would think they would make their latest product with those same eco-friendly materials. If this product isn't BPA free then I don't know why I thought this was an eco-friendly site. Now if one comes out in glass and metal I'd be inclined to at least look at it.